How late am I on this trend? I’m like your Gran when she discovered the button for the interwebz. OK, well I’m not really late… but I’ve only just got around to photographing a mani with the Boots 17 Magnetized Nail Polishes. I’ve decided that my favourite way to wear them is with a matte top coat which decreases their lasting power by about five years… but I dunno, they just suit the whole matte finish thing quite well. I get some real inconsistencies with these magnetic polishes, one hand will often come out perfect… or even just three fingers in a row. Then I completely get a dud one, despite not doing anything different. Does anyone else experience that? So frustrating! Also… as an aside, I’ve been re-organizing my nail polish collection, which, let me tell you, is far less fun than it sounds. I originally had them arranged by colour but I’ve changed it to brand and it’s made me realise that Essie is a very under-represented brand in my stash. Better get myself in check and start nail-blog hopping to find some gems to lust after! 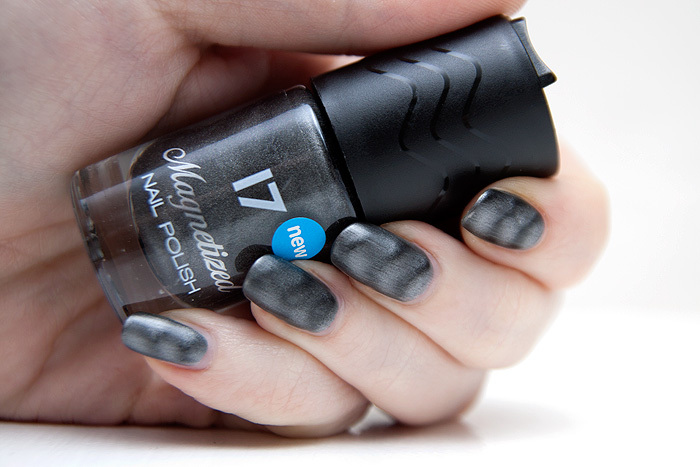 Boots 17 Magnetized Nail Polish in Grey is priced at £5.99 and available online or instore at Boots. I’m over these already. Bought one Nails Inc one and 3 17 ones and only used two of them so far, but didn’t like them much. Kept messing them up with the lid, argh, and also like you said, the patterns just didn’t look consistent. Especially my thumbs, they always looked weird. Don’t think like. Too funny! I am late on this as well. Just got a couple of bottle 2 days ago. Looks great on your nails. I really like the look of magnetic NP, and the matte top coat with this colour looks really good. nice one ! I really like the magnetised polishes but as my nails are fairly curved down, I find that they don’t get much of the effect nearer the tip of my nail. They aren’t particularly long either – it just doesn’t seem to work right! I seem to be the only one of my friends who has no trouble with the magnetic polishes, mine just worked right first time and no trouble since! I do like this look, I hated the crackle effect, made me think of really chipped polish! I bought the purple No 17 Magnetised Polish and was really happy with the result. I went to the MAC counter yesterday to get my Mum’s Christmas Stash and had all the MAC girls ooh-ing and aaah-ing over them, so I was quite chuffed with that! I’m not too keen on the other colours though, the silver is a possibility, but green and blue? Nah, don’t think so. I wish they had come out with a red, that would look great for Christmas.